Ald. Mark Tendam (6th) attends a City Council meeting. Tendam urged to move discussion of the proposed amendment to the inclusionary housing ordinance to outside council meetings, where the issues can be teased out in more depth. 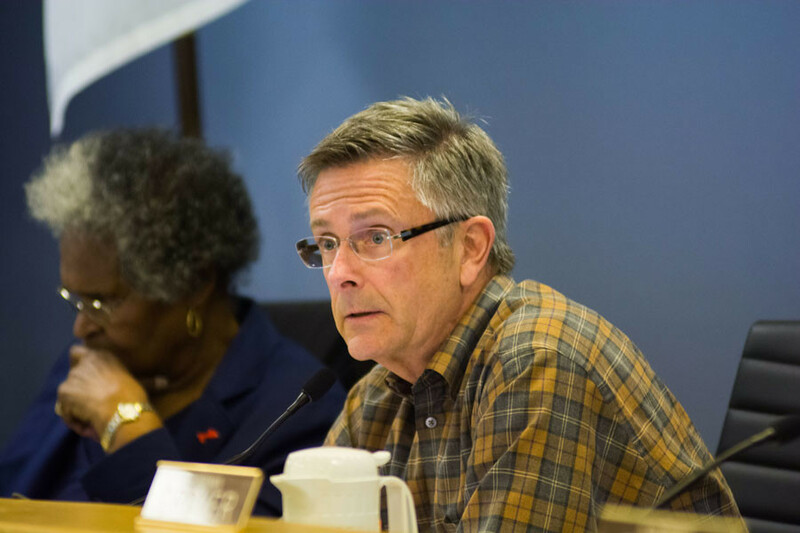 Despite requests from Evanston residents for aldermen to vote on amendments to Evanston’s inclusionary housing ordinance at Monday’s meeting, City Council motioned to postpone discussion on the ordinance due to concerns for the effects on residents. The amended ordinance would require a minimum of 10 percent of sale and rental units in Evanston serve as affordable housing units. While many community members and city staff spoke in support of the ordinance during the meeting, Ald. Donald Wilson (4th) said there needs to be further discussion on the source of funding for the increase in affordable units. Wilson said he fears expanding affordable housing in Evanston with this ordinance would cause the cost of living for other building residents to increase. He said the program wasn’t inclusionary — as its name indicates — and wanted to consider broader funding sources. “If this is a value to community, it should be something the entire community should be involved in,” he said. The 10 percent requirement covers small and large properties and encourages developers and landlords to create and renovate affordable housing options in Evanston with a fee for not complying. The amendment also outlined different requirements and greater benefits to developers for expanding housing near public transportation. City staff predicts about 250 new affordable housing units will be developed over the next five years under the amended IHO. The estimation was a departure from officials’ original prediction of the creation of 1,000 new affordable housing units in the next five years after implementing the IHO amendment. Ald. Brian Miller (9th) seconded Wilson’s motion to hold the vote, saying there were more imminent issues to discuss. However, community members who spoke on the amendment said the sooner Evanston’s IHO is amended, the better. Elliot Zashin, an Evanston resident who worked with groups such as Interfaith Action and the Good Jobs Campaign, said that the amendment has been discussed enough and it is time for the city to act. Suzanne Calder, the chair of Evanston’s Housing and Homelessness commission, added that city staff is already working on finding strategies to expand affordable housing funds for Evanston. However, Calder said these other ideas can be in addition to the proposed IHO amendment and does not need to preclude or replace it. Ald. Mark Tendam (6th) said aldermen and community members who haven’t been engaged in discussions of the ordinance amendments should come to the Housing and Homelessness Commission meeting, where the issue can be discussed at length.